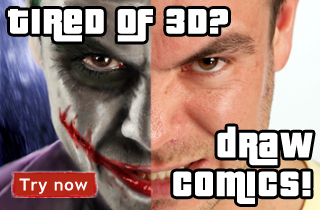 You can visit www.hdrskydome.com to get free samples of great HDR skies for better rendering purposes. 1 Click "Sky & Fog" then single click the "Sky Lab" button (the cloud with a rainbow) or, double click the "Sun Control" dial or, (Ctrl+K) to enter the "Sky Lab"
Disabling Sun Light in the "Sky Lab"
1a. 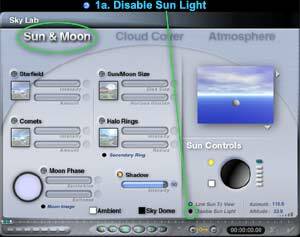 In the Sun & Moon Controls window click "Disable Sun Light" and a selected icon will appear . Click the finish check mark . 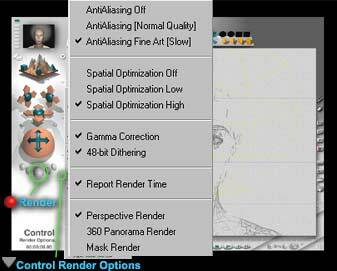 "Control Render Options" and Render button. 1. Checking your settings- When you are ready for the final rendering of your scene you should always double check your settings. 1b. Check AntiAutodesking Fine Art (Slow), , Spatial Optimization (High), , Gamma Correction, , 48 Bit Dithering, and , Perspective Render. 1c. Finally, Click the "Render" button and go have a yours self a nice long lunch! 2a. Click File > Save Image As... In the pop up window chose a place for your file to be saved, name it, save in .psd or .tif format and click Save. 2b. Close Bryce. When prompted to save, click Save.